Central Sulawesi is the island that keeps every beautiful thing in case of natural sightseeing and the ancient heritages. One of the ancient heritages that we can see in the megalithic stones that settled in Bada Valley. Located in Poso and part of Lore Lindu National Park, there are numbers of ancient stones that standing along the paddy field and green prairie. In addition to Bada Valley, these stone is also spread along Napu Valley, Besoa Valley and Baso Valley. Those megalithic rocks have beautiful shapes that unfold throughout the valley areas. The shaped is carving humans, animals, Kalamba and much more. According to existing sources, the numbers of megalithic stones have 1,451 pieces. These rocks are relic of pre-history that was allegedly older than Borobudur temple, but no one has to know the purpose and usefulness of these rocks at that time. The area of Lore Lindu National Park is dominated by mountainous granite rocks. When we see from above, we can see pretty rock that forms large carving. These megalithic rocks have large size, even the biggest reach diameter of 4 meters. The most famous Megalithic rock in Bada Valley is Watu Palindo at tilt position. The name of Watu Pelindo is Palindoarca, which means entertainer. This is true, because this stone seems having happy and cheerful face and friendly. The Palindo stone is indicating the impression of friendliness, a typical of children character. 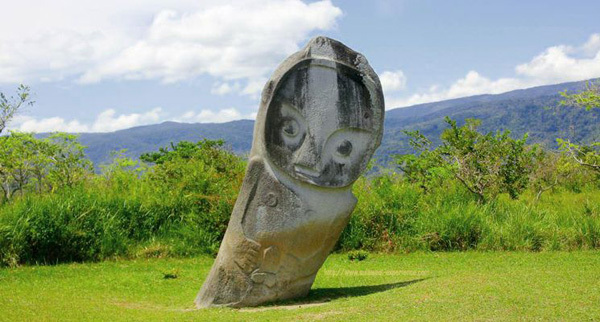 The stone reaches 4 meters high, and it has carved oval-shaped body, round eyes and a big nose that extends downward. In addition to Watu Palindo, there is other famous rock in figure of woman named Langka Bulawa. Langka Bulawa means the Queen with gold anklet. This rock has similar carving to Watu Palindo but have impressions of leader expression from Poso People. Both of the statues is located approximately 5 kilometers away. However, the source of the artist that made these stones is still unknown.